Cheim & Read is pleased to announce an exhibition of new paintings by Ron Gorchov, which will open on February 16, 2017, and run through March 25. With this exhibition, Gorchov continues his “Arguments with Rectangles, Flatness and Dimension,” to invoke the title of a series of works he made in 1966. It was at that moment in his career that he felt compelled to challenge “the ad-hoc acceptance of the rectangle,” seeking instead “a more intentional form that would create a new kind of visual space,” as he told the artist Ray Smith in an interview published in the catalogue of a solo exhibition at the Centro Atlántico de Arte Moderno, Las Palmas, Spain. In the same interview, Gorchov listed six issues that concerned him at that time, starting with “free painted edges” and ending in “synthesis of painting, sculpture and architecture” — explorations that continue to fuel his art a half-century later. Gorchov works on custom-fabricated stretchers that eliminate the corners of a conventional canvas: formal endpoints he deemed extraneous. It was a realization that would lead him to a radical stance against “the ad-hoc acceptance of the rectangle,” a position not unrelated to the liberation strategies sought by a number of artists at that time, such as Frank Stella and his shaped paintings. But Gorchov’s invention is unique in the way it moves painting forward while evoking the arts of antiquity — from Bronze Age armor to Coptic sarcophagus portraits to Sienese panel painting — straddling the past and future within the confines of a formal device. While containing identical elements — two amorphous shapes against a monochromatic ground in the shield paintings, and a single field of color encompassing the surfaces of the stacks — no two paintings are alike, with variations running from nuanced inflections to stark contrasts. From the bold primary colors of “Prometheus” to the muted greens of “Ilione,” or the startling leap in scale from “Erinna” to “Hippolyte,” the distances the artist can travel within the self-imposed restrictions of his chosen format are wide and unpredictable. Gorchov’s impulse to explore his ideas deeply and relentlessly have turned his work into an inspiration for a new generation of artists, who recognize the extent to which his far-reaching investigations within the microcosm of his individualized format feel more connected to the 21st century than they do with the postwar era from which they grew. 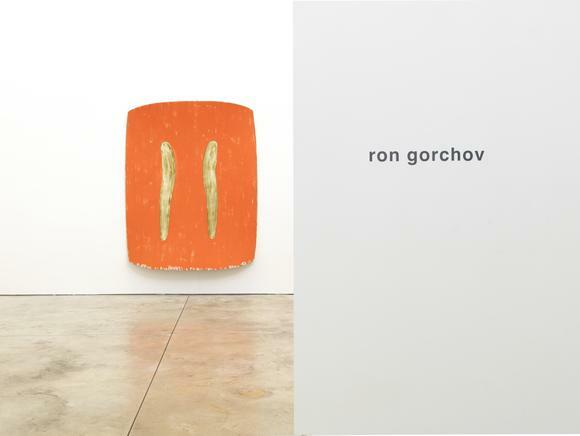 Born in Chicago in 1930, Ron Gorchov has lived and worked in New York City since the early 1950s. Following his debut at New York’s Tibor de Nagy Gallery in 1960, Gorchov has exhibited at the Museum of Modern Art, the Whitney Museum of American Art, MoMA PS1, the Queens Museum of Art, the New Museum of Contemporary Art, and Centro Atlántico de Arte Moderno, among other institutions.